Origins -- I've played accordion since I was 10 years old, but it only became a solid part of my life when I started playing for folk dancing. Back in 1964, I joined a local English Country Dance group. A British engineer on assignment in the U.S. also joined the group. He was a Morris dancer, and he was interested in performing a solo jig, but, because we didn't have recorded Morris music, he needed a musician. So I hauled out my accordion and practiced with him. This spread to starting to replace the recorded music for the English Country Dance group, and a few years later to trying to play for the local international (mostly Balkan) dance group, where I fell in love with the "odd" rhythms (5, 7, 9, 11, 15, 18, 22, etc.) of the Balkans. The experience of playing for dancers changed my relationship to playing. It involved the rigorous requirement of never stopping, never faltering, while at the same time providing the freedom to make melodic mistakes because the dancers were mainly listening to the general structure and rhythm of the tune. It gave a reason for playing, and opened up many opportunties for me that would otherwise never have existed. Folklore Village -- In the late 60's and early 70's I helped internationally famous folkdance/recreation leader (and magical elf) Jane Farwell begin to set up a folklore center on her father's retired dairy farm in rural Dodgeville, Wisconsin. Festival events were held at key times of the year, involving the folk customs, music, dancing, crafts and food of countries and cultures all over the world. I became the principal musician for dance performances, which brought my playing to a whole new level. The center attracted other musicians from around the area, as well as professionals from around the U.S. and the world. I became just one of a crowd of great musicians who were exposed to music from all over the world. Some of them became fiddlers and studied folk fiddling in Scandinavia. Peascods Gathering -- In the mid-1970's, I was instrumental in forming The Peascods Gathering, an eclectic folk dance band in the D.C. area. Originally intended as the house band for the local English Country Dance group, we were an assortment of mostly non-professional musicians who enjoyed playing together, and liked the variety of music that various groups of folkdancers were looking for -- English Country, American Contra, Balkan/Israeli, and Scandinavian. We were NOT a high class band with complex arrangements and a lust for practice and perfection. But the group nurtured many of us in an expanding repertoire of all kinds of music. And because Peascods wasn't demanding -- indeed, essentially a social group of friends -- it has lasted ever since, with perfectionists coming and going, and the rest just enjoying playing music. My Tunes -- Because of the band's longevity, we saw members pass through many decade birthdays, and a custom developed of most of the band members composing tunes to celebrate the various decade birthdays. A large body of music arose from this tradition, including many tunes that I wrote (or "made," as singer Gordon Bok would say). I've continued to write tunes -- about 80, to date -- in honor of special occasions or people, even though I've been gone from the D.C. area for many years. Balkan -- My love affair with the rhythms and harmonies of the Balkans and Greece has continued unabated for some 45 years. Several years ago, I agreed to play for one of the regular Wednesday evening music events at a local restaurant. I decided to make the second set of the session a "workshop", with a handout and the rhythm number, pattern, and nationality of each tune hung up on a string above me as it was played. It went over very well, and so I put my collection of example "odd-rhythm" tunes up on the web. and enjoyed the little Finnish folk dance group, who were dancing to recorded music. When I met the leader afterwards and asked why they didn't use live music, my fate was sealed. I played for their performances and Midsummer parties for the next decade or so. 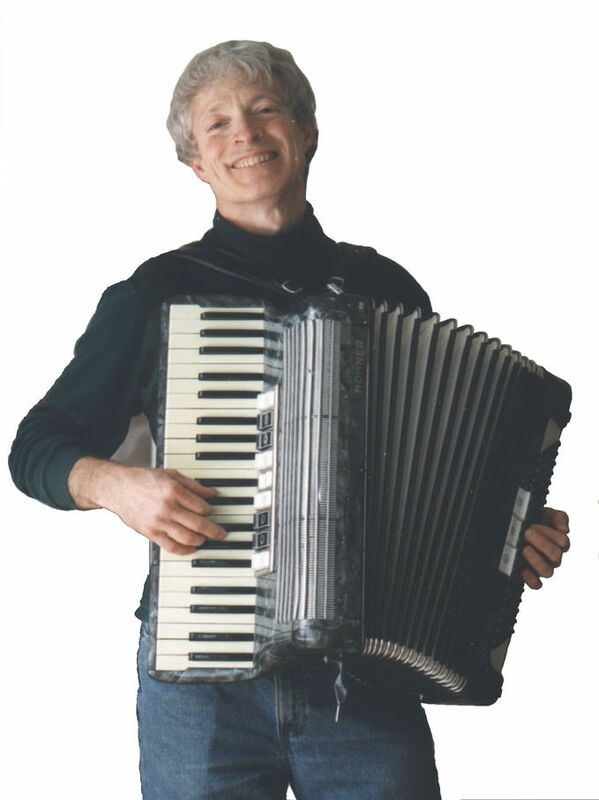 The Peascods Gathering began playing more Finnish music with the arrival of Finnish-American accordionist/folkdance-teacher Fred Aalto, a prolific composer of exquisitely "in-the-tradition" Scandinavian and Balkan music. So I wasn't surprised to find myself putting up a page of Finnish folkdance music in honor of the marriage of my elder stepson Trevor Corson to lovely Anu Partanen. Other tunes I like -- Over the years I've encountered tunes that for one reason or another I found it necessary or desirable to transcribe into ABC notation. This was usually either because I'd been asked to play a tune for which I could not find adequate or convenient sheet music, or because I'd heard it on the radio or a CD and, wanting fiercely to play it, transcribed it. It's a motley collection. The Upbeat -- Finally, I feel it necessary to acknowledge Marshall Barron, band-manager extraordinaire, who at the Pinewoods Dance Camp in 1975 drilled relentlessly into my head the importance of accenting the upbeat, rather than the downbeat. She completely changed the quality of my playing of jigs and reels (and perhaps inappropriately affected my playing of Scandinavian music :-)). She is absolutely right in claiming that that is one of the most important concepts in making such music danceable. Musicians will find that and other useful guidance in her To the Musicians. None of these pages would have been possible without the existence of ABC notation. It is a method of expressing music using a code of simple letters, numbers, and punctuation marks. It is probably the most efficient way to store written music, particularly the relatively simple music of the folk tradition; hence the large number of collections of such music on the Internet. 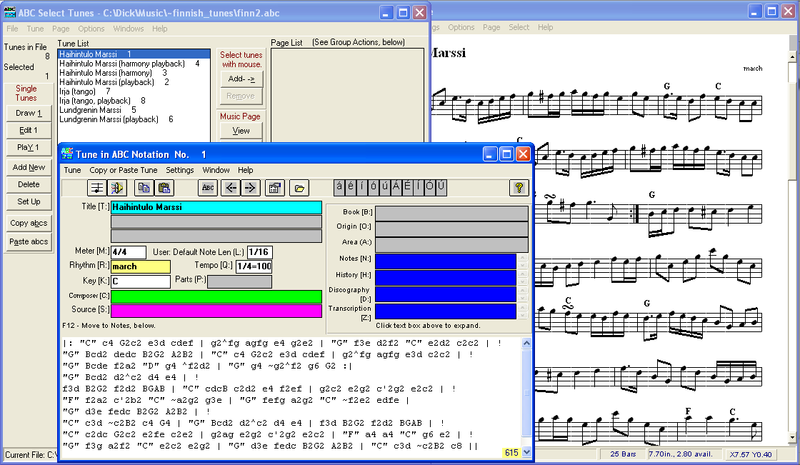 There are a number of computer programs available for translating the ABC code into sheet music or sound, or both. An excellent tutorial (local copy -- actually, a reference -- also exists. 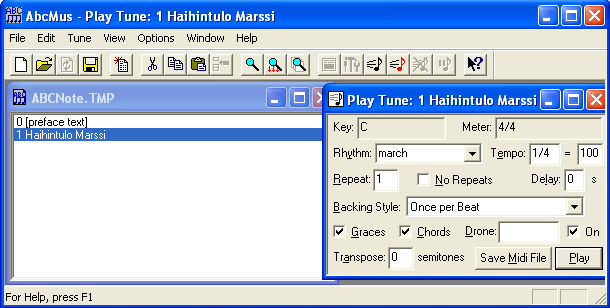 Before I learned about ABC, creating attractive, readable music was an arduous process. I would count the number of notes in each measure, then use this, the width of a staff line on manuscript paper, and a calculator to determine how many measures could fit on a staff line and where the measure-lines should go. I would then put tick marks at these points, dot in the notes with a pencil, ink them with a technical pen or marker, and then use a right-angle to draw their stems. A single tune took hours to transcribe. ABC and John Chambers's Tune Finder -- One of the most powerful aspects of this simple notation is that it can be automated to produce "sheet music" and sound files. Probably the most striking and useful example of this is John Chambers's tune finder at MIT, which has indexed a huge number of ABC files on the web. You simply type in a tune and you have access to a long list of various people's posted ABC versions of this. The site will then, at your request, generate a MIDI sound file of that version, or a "sheet music" graphic in GIF, PDF, PNG, or PostScript format. Through this site, you have access to folk dance music from around the world -- contra, Celtic, Scandinavian, Balkan, Israeli, English Country. You name it, someone's probably done ABCs of it and John has found it. If not, and you know where it is, you can tell the Tune Finder to index that site and include its tunes.